Ever wanted all of the lost garden terrain tiles as a single giant image? Well here they are. *Grass2 has been modified as a transition to the slightly off-color grass that connects with the swamp. This wasn't done perfectly, so it could be improved. *Snow2 was omitted because it does not transition properly with many other sets. May be corrected in future versions if there's a huge demand for it. *Overlay tiles (the large rock outcroppings, some trees, etc) are included in a seperate file. 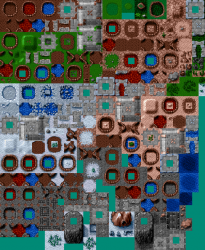 It's probably best to look at the original tilesets to line them up. *Every effort was made to avoid duplicating any tiles, but there might be some duplicates. *The bubble animations are probably just as well held off in seperate files. *Road and cliff overlays are hard to understand so they're not included here. what are the dimensions of the tiles?